The mass stabbings that occurred at the Crossroads Center (Crossroads Mall) in St. 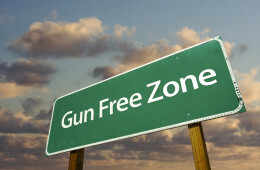 Cloud occurred in a gun free, weapon free zone. It appears that the armed citizen who stopped the attack was not allowed to legally be armed in the mall. The armed citizen was an off duty officer from another jurisdiction. The mall is a privately owned property. Guests who do not act responsibly may be asked to leave. If they refuse to leave the property, they may be arrested and prosecuted for criminal trespass. The policy does not make any exceptions for off duty police officers. As a privately owned property, the Mall may exclude off duty officers as they are not acting in an official capacity. Eight people were injured and the suspect died at Crossroads Center on Saturday after an attack reported about 8:15 p.m.
St. Cloud Police Chief Blair Anderson said the victims were stabbed by a man dressed in a private security uniform. An off-duty police officer from another jurisdiction shot and killed the attacker, Anderson said. Anderson did not say where that officer serves during the news conference that started after midnight. “At approximately 8 p.m., an armed suspect entered the Crossroads Mall. That individual made some references to Allah and we confirmed that he asked at least one person if they were Muslim before assaulting them,” said St. Cloud Police Chief Blair Anderson. I doubt that the mall will pursue legal sanctions against the armed citizen who stopped the attack. They are fortunate that the officer chose to ignore the mall rules that required people to be disarmed. The rules did not dissuade the attacker. This is likely another incident of “sudden Jihad syndrome”. The current administration has gone to great lengths to characterize such incidents as “not a terror attack” because the attacker did not conspire with others from a known and recognized terror organization in order to conduct the attack. A retired police friend referred to such characterizations as “no paid up Al Queda member ship card was in his wallet”; therefore it was not a terrorist attack. The Fort Hood Terrorist attack was characterized as “workplace violence”, even though Major Hassan claimed to be an Islamic soldier, repeatedly, in court. With a dead attacker, it is easy for authorities to find some other motivation besides radical Islam for the attack. A great many Islamic attackers have significant personal problems. Martyrdom for Islam offers a simple, easy way to end the personal problems and to obtain a sure-fire guaranteed ticket to paradise.